The much-anticipated edition of the Air Jordan VII Retro will finally hit the market this month and based on the noise that is making in the market right now, this shoe is must-buy this April 2011. 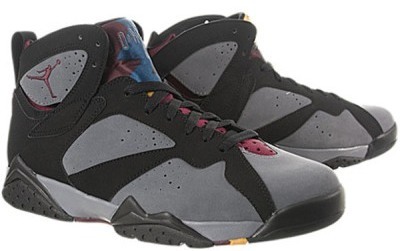 The Air Jordan Retro VII, which is one of the most popular Jordan shoes ever, will come out in Black/Light Graphite-Bordeaux colourway. The “Bordeaux” edition, which is probably the best colourway of this shoe, features a black and light graphite upper part with the Bordeaux placed on the tongue. Want a taste of greatness? Then buy this one and we can guarantee that you will never regret it!